New College Library will close early at 5pm on Thursday 29 November as installations and road closures for ‘Light Night‘ mean that readers will not be able to exit the building through the main gates after this time. 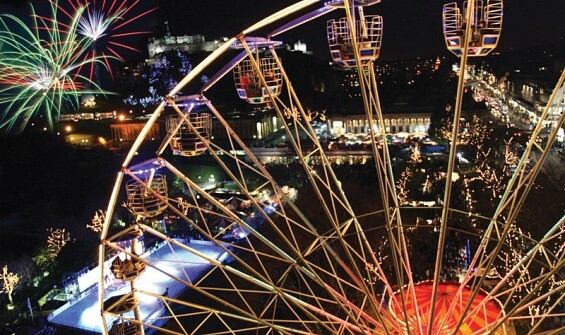 The ‘Light Night’ performance, including firework display and aerobatics, is scheduled on the grassy area at the top of the Mound at around 5pm to 6pm on Thursday 29th November, with a rehearsal in the early afternoon. There will be a full road closure in place all day, with pedestrian access to enter and exit the building through the main Quad gates throughout the day until 5pm. Sikhs around the world will celebrate the birthday of Guru Nanak on Wednesday 28 November. Guru Nanak (1469-1539) was the founder of the Sikh religion. 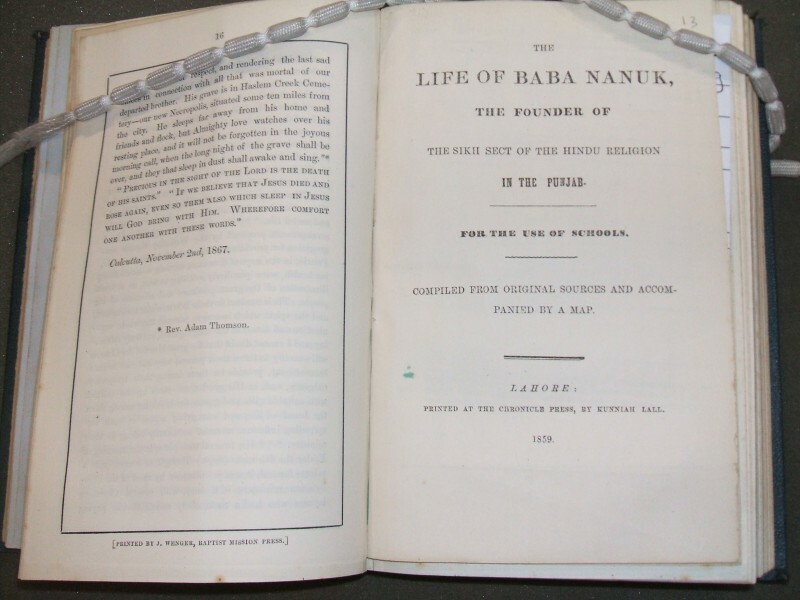 The life of Baba Nanuk, from New College Library’s Pamphlets collection aims to give an introduction for schools to Sikhism’s founder and the early history of the religion. 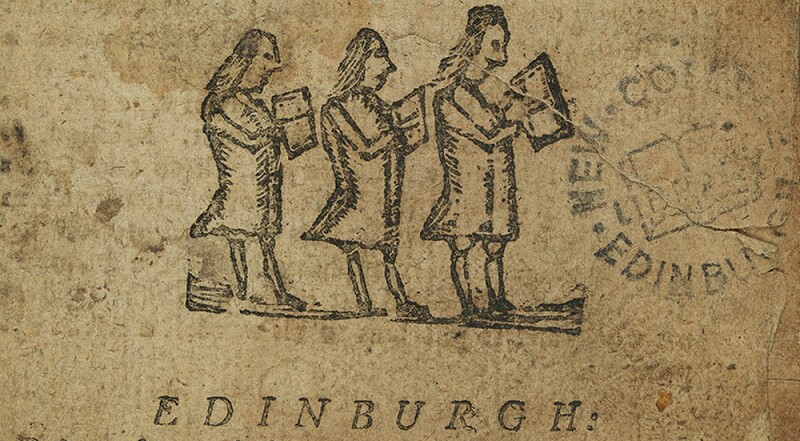 New College is the only library in Scotland to hold a copy of this work. This item was catalogued as part of the Funk Cataloguing Projects at New College Library. This blog is six months old now and has had over 3,000 hits – thank you! I’d love to know a bit more about who out there is reading my blog, so I’d appreciate it if you could fill in this 5 second poll. Thanks again! On trial now for University of Edinburgh users is Brill’s Encyclopedia of Hinduism Online . Brill’s Encyclopedia of Hinduism presents the latest research on all the main aspects of the Hindu traditions in essays written by the world’s foremost scholars on Hinduism. The encyclopedia encompasses a variety of regional traditions as well as the global world religion. The fully searchable, dynamic digital format currently includes volume I of ultimately five volumes – vols II and III are due to be added in December. Access via Brill Reference Online. University of Edinburgh users can access the trial on the E-resources trials page. The trial ends on 18 December. A prayer for a pudding? 25 November 2012 is traditionally Stir Up Sunday, when cooks plan to make their Christmas puddings so they have time to mature before eating on Christmas Day. This tradition is linked with the opening words of the collect for the day in the Book of Common Prayer of 1549, which reads ‘Stir up, we beseech thee, O Lord…’ Always read just before Advent, this became remembered as a reminder to start stirring up the puddings for Christmas. 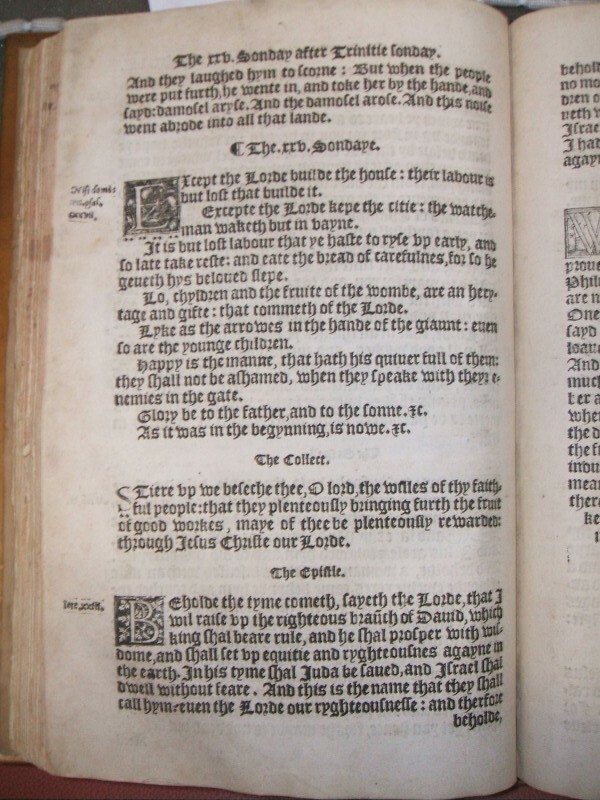 New College Library holds this copy of the Book of Common Prayer printed in London in 1549, the year the Book of Common Prayer was adopted by the Church of England. We can see the exhortation to “Stir up ..” , spoken over 450 years ago in the reign of Edward VI of England, about two thirds of the way down the page. This book is part of the Dumfries Presbytery Library, currently being catalogued as part of the Funk Cataloguing Projects at New College Library. It bears the signature of Dr John Hutton, who donated the collection of books that form the foundations of the Dumfries Presbytery Library. The feast of St Cecilia’s Day is traditionally celebrated on November 22nd. 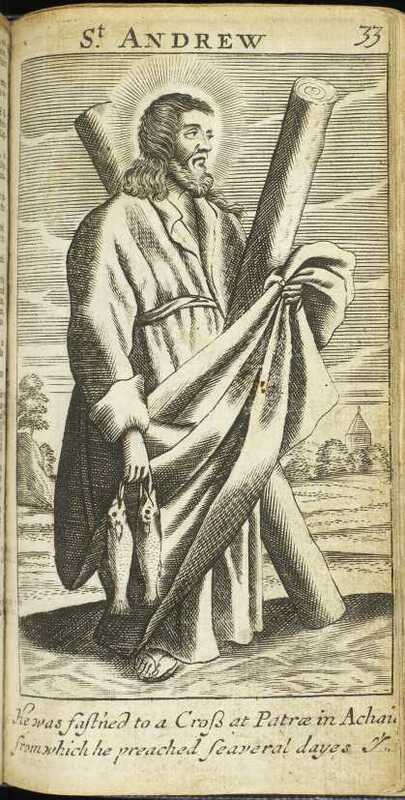 A 3rd century martyr, St Cecilia is known as the patron saint of musicians. Her legend relates that, as a young Christian, she was betrothed to a pagan but she had already vowed her virginity to God. As the organs played at at her wedding feast, Cecilia sang (in her heart) to the Lord, asking that her heart remain pure. Here’s a book of Psalms to remember her by. 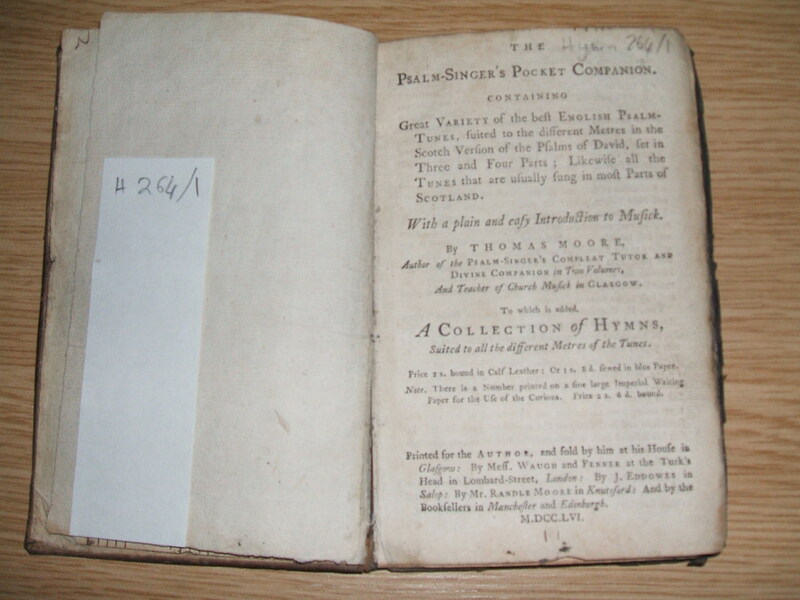 Thomas Moore’s Psalm singers’ pocket companion is a publication from the revival era known as Gallery Psalmody, where leading singers and choir were located in a loft of the church. The new style lasted for about a century from 1755, and its main features were choirs singing in harmony of usually three parts, with some solo sections. Thomas Moore (- d. 1792) was a music teacher from Manchester Cathedral who came to Glasgow to teach singing. 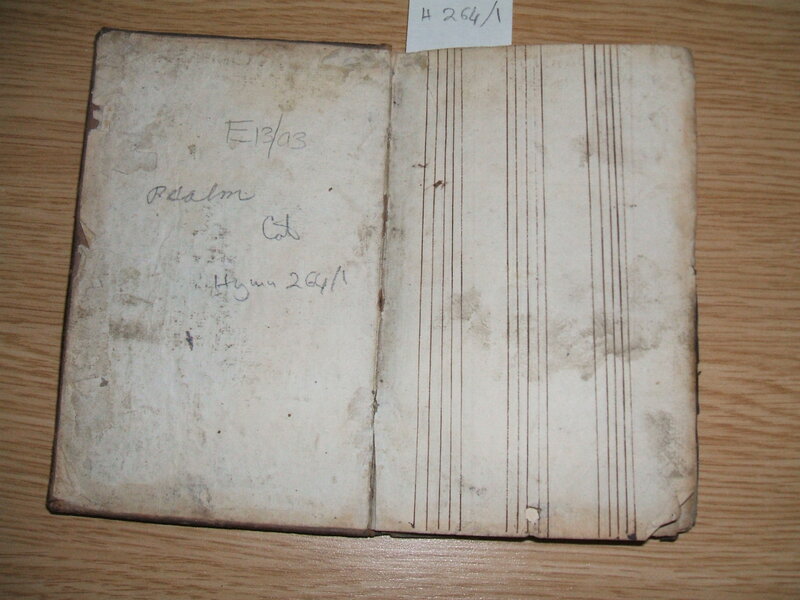 This item is small, or pocket sized, and contains a number of manuscript doodles which may testify to the singer’s mind wandering elsewhere. Also interesting are the pages of handwritten music staves, perhaps to allow the singer to make notes of new tunes or harmonies. The Psalm singers’ pocket companion belongs to the Hymnology Collection, and was catalogued as part of the Funk Cataloguing Projects. 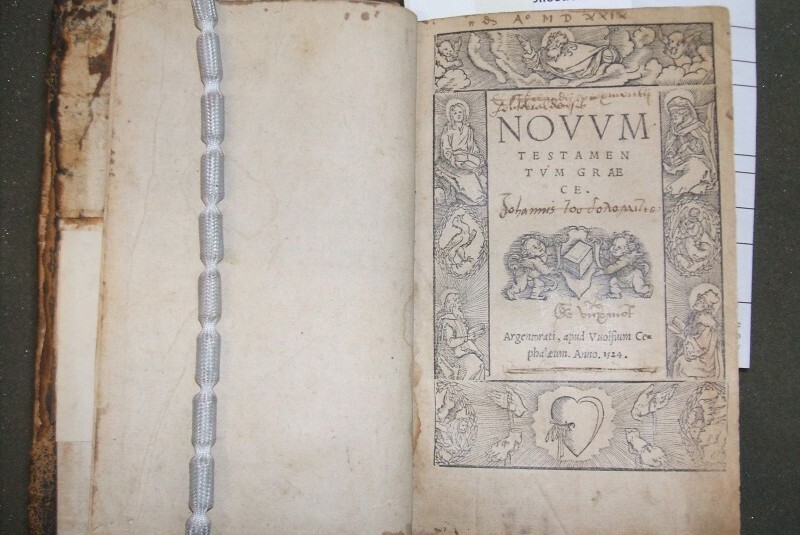 With thanks to our Project Cataloguer, Oreste de Tommaso, for supplying details of this item. A growing resource for Jewish / Ancient World Studies – I see that as well as the digitized images of Genizah collections at Cambridge and Birmingham there are links to related open access journals and pdfs of all the 8 volumes of “Ginzei Kedem” – a Journal devoted to Genizah research and published by the Ben-Zvi Institute.